During the heat wave last week, Miss Maggie and I took a trip to Old Town to do a little treasure hunting. Having spent some time eyeing jewelry and kitchenware in the antique shop (have I mentioned I have a dish problem? ), we went to the vintage clothing boutique, Madhouse Vintage, right across the street. Walking into the store is like opening the door into the room of your very best (and most stylish) friend. 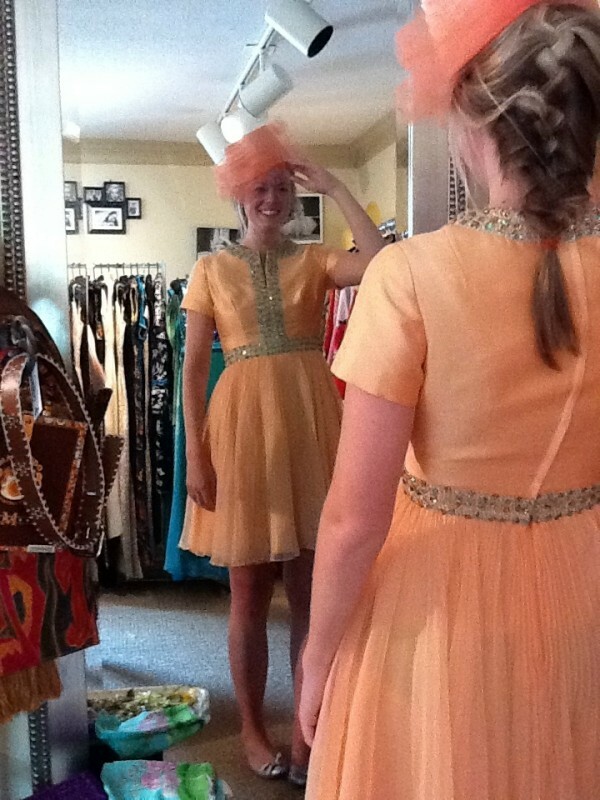 We loved the owner, Caroline, and we wanted to spend hours playing dress up in her store. Had we not been feeling less than fresh because it was hotter than Hades outside, we probably would have lolled about the afternoon in layers of tafetta and tulle, donning hats and sipping mint juleps (which she doesn’t sell, but hey, it’s my daydream). As we admired and held up dress after dress, each immaculately pressed and hanging with others similar in color or style, Caroline told us stories about them: where she found them, how and where they might have been worn. In the end, we HAD to try on a few. We were mesmerized by the heat, fashion, and Caroline’s accent. *Don’t mind the photo quality…Shaky hands and cameras do not blend. Le sigh. Doesn’t Maggie’s pick look like fun in dress form? The sequins. The chiffon. The twirling potential. Plus, the color is so dreamy, like a sweet peach in summertime. I love the feeling of putting on a great dress. Nothing beats it. A great dress is like a magical magnifying glass: suddenly you notice all of your good features, while everything else fades into the background. It’s one of the simple joys of being a lady. Maggie and I wish we could have tried on and taken home the whole store…but don’t worry, Caroline–we’ll come back to model and play! This entry was posted in b, g, l, s and tagged bluffton, glee, ladylike, shopping, twirling. Bookmark the permalink.